June | 2009 | okay, peanut. There’s a relatively new park about 5 minutes from our house and since Lily’s arrival we’ve been going once or twice a week on nice evenings for a walk. There are probably a dozen fields, including one turf field and at least one with lights. There’s an amazing paved path for walking, and a playground that would knock your socks off (Okay, not really.). Well, our plan was to attempt a walk tonight – but it didn’t really work out so well. When we left the house, the sun was shining and all looked well. 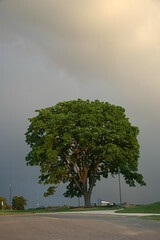 When we arrived at the park, however, a dark cloud lurked just miles away, and we were unsure of whether or not it would hit us. We did walk, but not far, staying close to the car. I’m certain it took us longer to drive there and back than it did for us to walk. Oh well; the fresh air was good for all three of us. It never did rain. Sure, I would have enjoyed a nice shower in the park, I’m sure Lily would not have been happy. So now we’re back home! I’ve taken care of things in the kitchen, tried feeding Lily (She wasn’t much into it. ), and decided to sit down and play Mafia Wars on FB try to upload some recent pictures. As I was going through them, I realized (1) I haven’t taken that many lately, and (2) I haven’t uploaded in ages!!! So, for those of you who would like to see some updated pics, I’m working on them now and should have them finished soon – yippee! You know where to find them, and if you don’t, let me know and I’ll send you that way! Now that I’m back to work and into a routine again, I hereby vow to TRY to blog on a more regular basis. Even if it’s just snippets of what’s been going on, what Lily is up to, or what we had for dinner last night (Okay, that’s pushing it! ), you’ll be hearing from me more often. So I’m back to work – blah. Lily had a “trial” half day at day care yesterday, and for me, it was torture. I cried all night Sunday night, then all morning on Monday. It was SO hard to leave her, and even though I know she’s receiving awesome care, she’s still my little peanut, and only her mommy can love and care for her best. I’m glad we did a half day and I didn’t go to work yesterday because I would have been a disaster all day. Today was hard with a work day in the mix, and I thought it would be worse than yesterday, but so far I’ve been okay. I’ve been sad, and haven’t stopped thinking about her, but this is what we have to do, so I’m going to have to accept it. It’s okay. For those of you who knew Justin was taking the LEED test, I’m so incredibly excited to report to you that he PASSED! He can now put “LEED® AP” after his name – yippee! He completely deserves it; he studied so much and was more prepared than he’d like to admit. Woohoo! I’ll try to post pictures from the past week or so to flickr tonight – we’ve been incredibly busy! We spent a long weekend in Pittsburgh – it was so fun and totally exhausting at the same time! Michelle and I headed out with our three little ones on Thursday morning and came back on Sunday evening. It was awesome spending so much time with Michelle and the boys – those two are an absolute riot! For all of the traveling, running and visiting we did, all three of them were so good. Those two are awesome helpers! They helped feed Lily, kept her quiet in the car, wiped away her spit up, and entertained her. Kannon is SO into her! He’d sit next to her bouncy seat, just talking away! Adorable! Memories from the trip include the purple slide, cotton candy and sno-cone sugar rushes, “Aunt DiDee, whatcha doin’?,” grandpa leaving his “mess” on the front walk, two trash can hauling boys, the comedy act we created at On the Border on Saturday night, and the pee break on the way home. XOXOXO! I’m looking forward to this weekend, as we plan to stay home ALL weekend and get stuff done around the house. After being away all last weekend, I feel like there’s so much for me to catch up on. I have unfinished projects that I started when I was on leave that I’m waiting to finish, like my sling and pacifier holders! I also have some organization projects to wrap up – one final go-through of my clothes before they’re either donated or put in my dresser once and for all, and a serious inventory of what Lily has/doesn’t have for the next year or so. I want to work on a secret project I’ve been tackling for the past two weeks or so, and that will take an incredible amount of time and effort to get moving (This is my “mission,” for those of you who know about all that …). I also plan to help Justin finish up the exterior of the shed – while I’m not much into roofing or stone installation, I love to paint, so it’s my mission to finish up the painting for him. Of course, when you throw Lily into the mix, things take 3 times longer – and I’m totally cool with that – but what I plan may not be what I actually accomplish! We’ll see. So, what have YOU been up to? :0) I’ve got lots more to tell you, but I’ll save them and mix them in with my other snippet posts. This one didn’t turn out to be so short, now did it!? Don’t think first, think daily and meaningful. For the past year or so, I’ve been subscribed to a daily e-mail list from bibleleague.org. I’ll be completely honest with you – 9 times out of 10 99 times out of 100, I don’t read them. It’s not that I don’t want to, I just don’t. Write down specifically how you are going to take the truths of God found in the Bible and “impress” them on people in your life. What are some ways to make this verse practical and applicable? Lily and I are going on a little road trip today, so I should have some time to give this some thought and think of changes I can make in my life. How about you? How can you change your way of living so as to make valuable “impressions” on those around you? Before I begin, let me first take a moment to wish all of the father’s I know, and even the ones I don’t know, a very happy Father’s Day. This year, I’m blessed to know several first time fathers, including my husband, and I hope their day is very special. Being a good father, dad, daddy or pops takes a very special person with a big heart and lots of patience, and they deserve to be honored for their continuous love and sacrifices. I only have a few minutes, but I want to apologize. 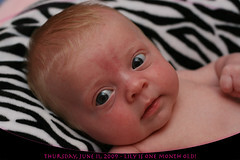 I wish I had more time to blog; more time to share with you what’s going on with us and how Lily is progressing. She’s reached several fun milestones over the past few weeks, and most of you are in the dark. I have to say that I honestly had no idea this parenting thing would be so time-consuming for me. I knew it was a lot of hard work (And SO worth it! ), but I just didn’t realize how little time I’d have after Lily is taken care of, we’re all fed, the house is clean, and the day-to-day demands are fulfilled. I’ll try harder, but I have a feeling once I go back to work (Which is coming WAY too soon!) things are only going to get way more crazy. So quickly, a few updates. 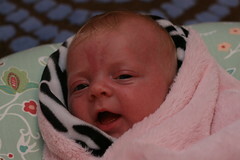 Lily is spending much more time alert and awake, and is responding to so much more now! She’s noticing new objects, which is so cool! She’s also making lots of new noises, including a new shriek when her bottle is taken away so she can burp. It’s hilarious! The most exciting, though, are her smiles! She started smiling last Monday, and it’s awesome! We are loving these small steps and are trying to absorb every second of it because it goes too fast. Lily is also growing like crazy – at one month, she weighed 9 lbs 5 oz! She’s grown out of many of her newborn clothes and is filling in those 0-3 months outfits! It’s too cool, and kind of sad at the same time. As for nights, she’s still got a great schedule, for the most part. She usually wakes up every 3 hours to eat, but over the past week, she’s thrown in some 4 hour stretches – let me tell you, they’re MUCH appreciated by me! Last night, she even went from 9:20 pm to 2:00 am … that’s almost 5 hours! Of course, she still gives me some seriously tough nights, but those are to be expected, and they’re few and far between. Well, I’ve already spent more time than anticipated updating you, so it’s seriously time for me to run. For those of you who have e-mailed/called/left FB messages and are still waiting for a response, I’M SORRY! I’m trying, and am making a promise to try harder every day. I do love you – I promise! And in general, I’ll try to keep the updates coming on a more regular basis! She’s cross-eyed much less now than before. It was always so fun to see her eyes go all crazy! The girl’s got a seriously strong neck. She wasn’t cooperating tonight, but pics from a few days ago show just how strong those muscles really are! Sassy is her middle name; she likes to do the back arching thing when she’s mad. Right! Her new fun is screaming when we take the bottle away to burp her. It’s hilarious! She’s eating 2.5 to 4 oz at a time – every 2 hours or so during the day, and every 3 hours or so at night. It’s official – she does like riding in the car! While she’s not a huge fan of getting in her car seat, she’s quiet almost instantly once the car starts moving. The Baby Bjorn is our favorite accessory. Her nickname, at least my nickname for her, is Peanut. I also call her Lil from time to time. At this point, she’s grown out of her Gerber newborn onesies, and she’s days from growing out of her Carter’s onesies. Oh my! 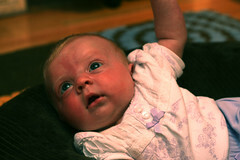 She still wears most of her newborn clothes, and many things from her 0-3 month wardrobe. Her eyes are getting much lighter from the inside out. It’s so fun to see the progress! She hasn’t lost her blonde hair – yay! In fact, it’s growing like crazy, and we love it! Her sleep position most often involves both hands above her head and her mouth wide open. She’s had her first sleepover at grandma’s! We went to visit grandma, grandpa, aunt April & aunt Alice and stayed for the night. Baths are a happy time, thank goodness! Typically, she likes to be held and is usually awake between somewhere around 3 pm until 8 or so. Lily’s got lots of family and friends that are crazy about her! You can never imagine what this journey will be like, and it’s already been full of surprises. I think I’ve finally settled into being a mom, and will admit that the first few weeks were extremely difficult. Between my crazy postpartum hormones, the overwhelming addition of this new person, and the day-to-day adjustments here at home, there were times I was sure I wouldn’t make it! I’m loving every second with her. It’s killing me to know that the end of my time at home is drawing near. While I know she’ll be receiving great care, I just can’t stand the thought of being away from her for so long. She makes me laugh so often it’s ridiculous! She’s hysterical when she coughs, and I love to watch her sleep. When we burp her and she starts to fall asleep, sometimes she looks like a catfish … seriously! It’s so cute! And startle her – all four limbs flail around, and usually end up stopping suspended in the air! I love laying on the couch with her while she sleeps. I hold her in my arm and wrap her up with my other arm; it’s so cozy! Having children, in my mind, is what life is all about. There’s not a day that goes by now that I don’t reflect on just how blessed I am to have this miracle in my life. She means the world to both Justin and I, and now that she’s here, I can’t imagine life without her. Every day is a gift! I’ve learned that no diaper bag is ever big enough for all the stuff one must carry around. My goodness! Those little fingernails are SHARP, my friends! Finding out that you’re allergic to penicillin after receiving to IV doses in the hospital is worse than natural childbirth. No joke. For those of you who have asked, yes, I would do it all over again without an epidural. Yes, I know I’m crazy. I’m amazed at how motherhood just comes to you. I really knew little about these little people before Lily. I guess because there’s no choice, you just figure it out as you go. I thought it would be scarier and more difficult, but it’s been more like second nature and common sense. Yay! I never thought I’d “wear” as much formula as I do. There’s no neatness to this job, and all organization goes right out the window. I feel like my head is spinning! Oh, and I didn’t realize these little people are so time consuming! Days consist of feeding for an hour followed by an hour or so to get things done, just in time to feed again. 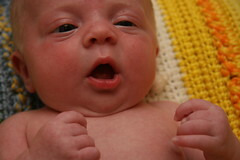 Nights are the same hour long feedings with changing & settling, then hour and a half naps, give or take. Speaking of which, in the past month, I’ve spent one night in bed. One night. The rest were spent mostly exclusively on the couch, while others were a mix of time in bed and time on the couch. I have yet to have a full night’s sleep, and I am admittedly terribly jealous of Justin’s full and peaceful nights. I’ve been away from Lily three times in the past month – one trip to the grocery store while Justin stayed home with Lily, a ride in my dad’s new Camaro yesterday afternoon while my mom kept Lily, and a quick trip to pick up dinner this evening. All together, we’ve spent no more than an hour away from each other! So those are some reflections from Lily’s first month here with us. It’s been such a wild ride, and while it wasn’t always easy, we’re finally settled into what feels like a “back to normal” life! We’ll keep you posted on her progress, and if you have any questions – ask! I hope to update with her new weight and length tomorrow, too! Yay!